What is a Weta Trimaran? Let me explain, this week we’re sharing all of our favorite boats, some we’ve tried and some we can’t wait to try. The Weta Trimaran is just that. It’s a very cool Trimaran. Weta has engineered this boat to perform like a high performance race boat. As fast as can be, yet stable and easy to sail and set up. Who could ask for more right? Except…what color should I choose? * The gennaker can be operated by a child. We dare anyone to say if they can beat that! Check out this Video About the Weta Trimaran! Below the Video is a link to their Website. 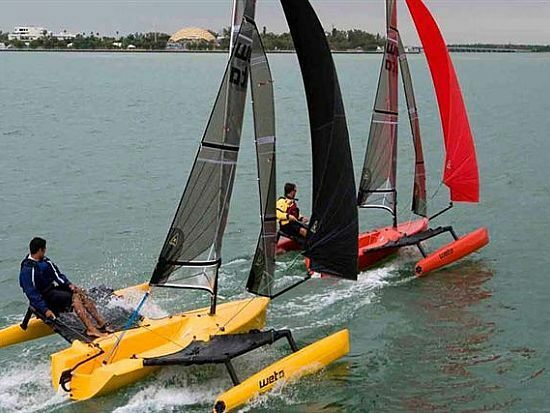 Click on Weta Trimarans and To Find Out More Info.